Built the pen a few months earlier, beneath the treehouse I'd built years ago. 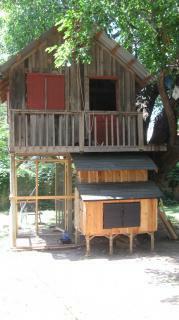 Figuring the chickens would need a coop, I started cobbling one together from scrap and salvaged wood. 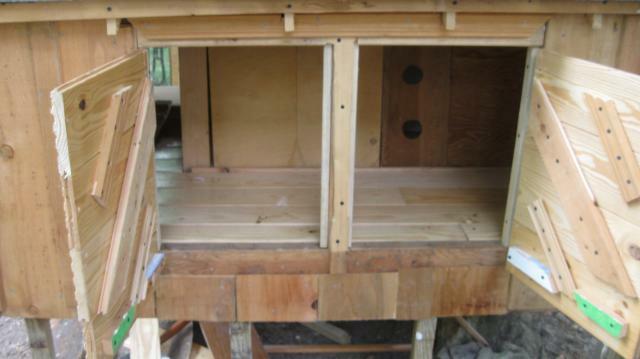 The roosts are installed in the taller half of the coop, and nesting boxes are in the shorter part. All the gables, and much of the backside, inside the pen, are devoted to ventilation due to the intense Great Plains heat. Due to the periodically equally intense Great Plains windy cold, I have fashioned covers for the gable vents, and will be able to selectively cover up the gables and the backside vents, as needed. The roof was laid on so that there would be some ventillation around eaves, even if the rest of the vents were all buttoned up. Nonetheless, these constant vents are fashioned to prevent the wind from directly entering. I followed some good, on-line advice and made no bones about over-building the coop, just to have a good chunk of mass for the sun to warm up every day throughout the winter, for the whole passive solar thing. I framed it out with 1x2 stud walls, covered them with plywood sheathing, and then laid on 1" thick fence planks in "board and batten" fashion. So, obviously the egg doors on the left, and the taller clean-out door on the right. 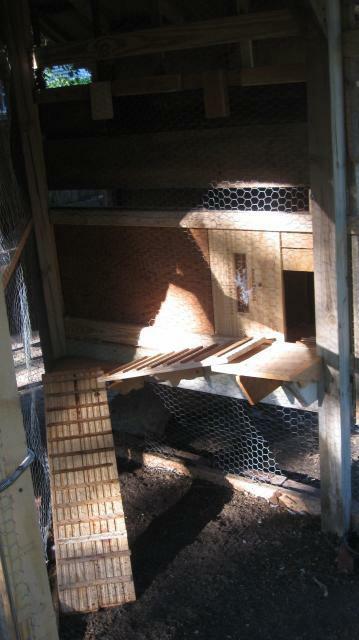 A view of the chicken ladders leading into the coop, from inside the pen. Juvenile chickens. All but the white one were killed, sadly, by the family dog. 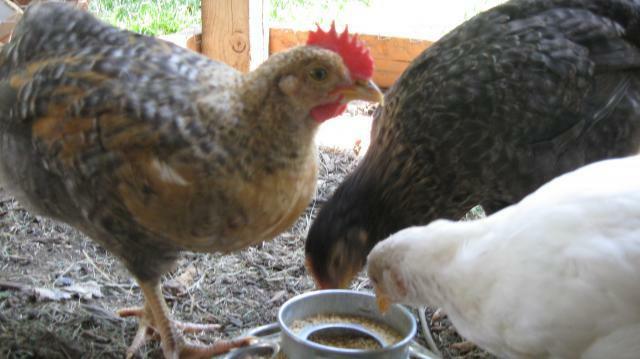 The white one is grown up and laying, along with another surviving (but not in the photo) barred rock hen. The white one now has an impressive big red comb and wattles. Because she lays white eggs, I figure she must be Leghorn-ish. Before we knew her gender, my daughter called her "Salvador" after Salvador Dali. Ironic that her name means "savior" because she didn't manage to save any of her cohort(s) from the friendly family dog. We didn't want to believe it was our sweet, dear samoyed, but after the second kill, there was no other explanation. We could only conclude the dog just picked them up, instinctively, and shook them around like a dog toy. No blood, no malice. In fact, the dog is fond of the chickens. He just doesn't appreciate that they're NOT dog toys, or how weak their necks are. The solution has been to let the dog and chickens range at different times, and to place a "chickens out / chickens in the pen" sign on the back door. "GRAND OPENING" -- the egg doors, B.C. (before chickens). Note the solid wood, tongue & groove flooring, intended to elevate part of the floor. inside the doors are now 4 nesting boxes, made from wine crates, full of wood shavings, with nest eggs in case those hens forget what they're supposed to be doing. Somehow the hens both lay in the same nesting box. Note the sand, beneath the roosts, inside the clean-out door. It's at a lower level than the wood flooring. The idea was to discourage pooping in the nesting area (to the left, with the shorter ceiling). So far, it's worked out really well. If the chickens want to lay, they walk straight back to the nesting area, and don't poop very much in that part of the coop. Beneath the roost is another story. That's why there's sand underneath the roost, along with the poop scoop hanging outside, top right. 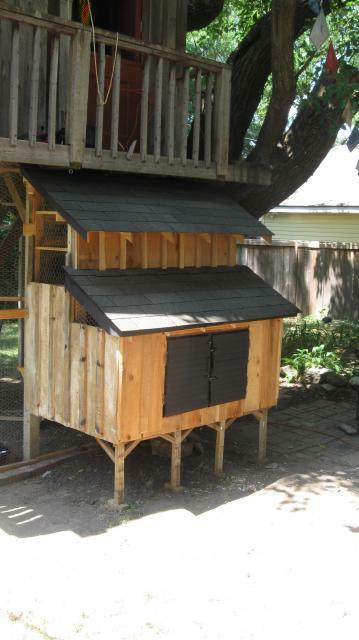 The sand beneath the roosts can be scooped clean in 2 minutes or less. This picture was taken with the ventillation covers on each of the half-gables, which in fair weather are covered only in chicken wire. Covers are up because I had just made them and wanted to be sure they fit. Now I see the squalid construction mess still sitting around. 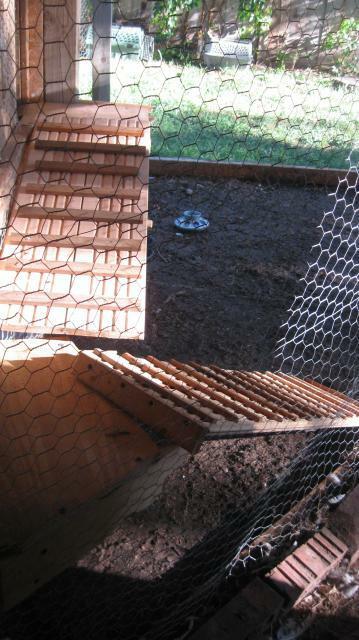 Obviously the chickens don't care as much about how genteel their home is as, say, the neighbors. I guess the rustic treehouse paved the way, and desensitized them to the other hillbilly stuff that would and did follow. This really is the unvarnished, shaggy construction site; below at back are the cat carriers that had served as nesting structures, inside the pen before the coop was opened up. All this and no complaints from the neighbors, thank goodness. At least not to my face. 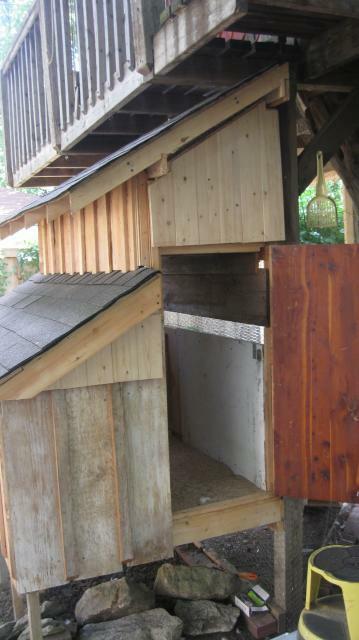 The chicken ladders, for ingress to the coop: up the stairs and to the left. The white hen took to roosting inside the coop the moment it was opened up for business. The other birds preferred the open-air roosts inside the pen for a while. I surrounded the bottom edge of the pen with bricks so that I could see whether they were moved around by critters trying to get in. So far, no signs of incursions, despite ample raccoons and possums. The family dog is probably somewhat of a deterrent, even though he often sleeps indoors. Another thing we've got going for us, in terms of varmint deterrence, is the fact that the heavy clay soil inside and around the pen has pretty much become hard-pan. Eight years of shelter from the rain have made the ground very inhospitable to digging claws of any kind. In summer I would wet the soil inside the pen, superficially, just so the chickens could peck around in it without stubbing their beaks. Even then, the soil was usually dry in a couple of hours, and once again good for dust baths. I'd better take and post some new pictures soon. 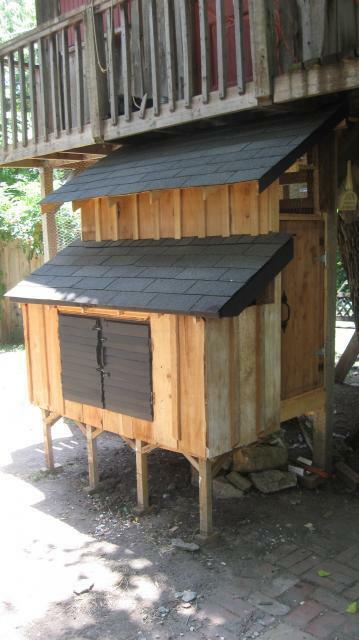 The coop has been up and running for over three months now, the hens all grown up and laying, etc. Nice coop and run. Needs an update though . 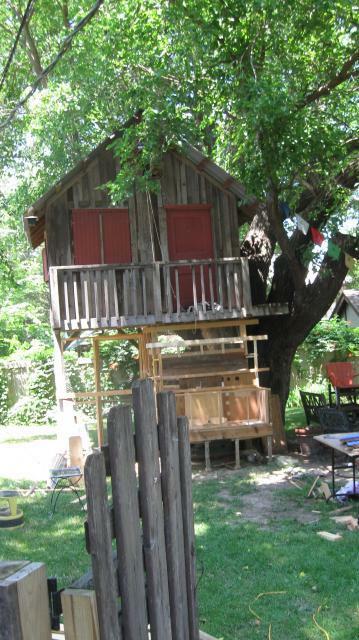 I am green with jealousy over the treehouse. The coop is lovely too. You have a birds eye view. very nice! 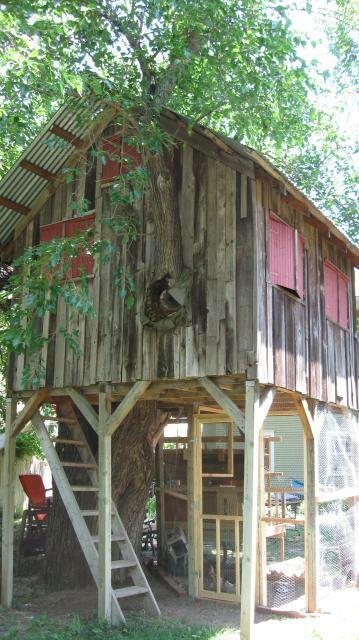 love the tree house, sharing it w chickens is great!